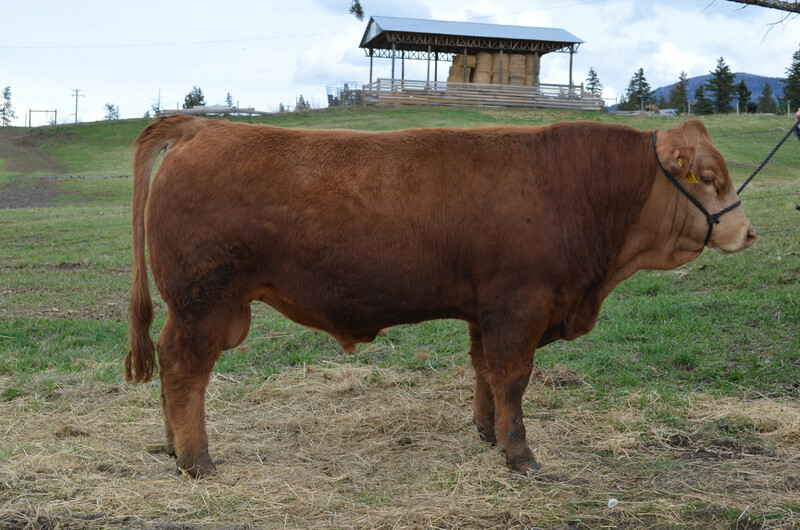 This bull will give you great replacement females as well as heavy weaning steers. He weaned off his dam on September 7th at 926 lbs, from pasture with no creep feed. On March 16/19 the bull weighed 1338 lbs. Interesting composite lineage. Thick and meaty with impressive performance and his dam's udder quality is a plus. Not to rain on your parade but he appears to be either/or sickle hocked/posty behind. I do see what you're talking about.. I didn't notice it in person when I saw him. Easy to get gobsmacked doncha know. I also know these people don't polish their animals to mask anything..
A rarity and much appreciated. Not to mention his slick top line. Likely some close up in the pedigree were notorious for poor disposition. Often difficult to distinquish between genetic and man made. Looks like a fine bull to me that will compliment the herd you have at home quite nicely. His WW and YW are right where I like to see them on bulls that haven't been pushed. Looks like none of the EPD's have a whole lot of accuracy, best I see is BW at 0.29.. I don't think they have a lot of customers where the calves get registered... Gelbvieh association wants $25 per head per year which I think is a pretty steep price. Even his sire, grandsires and great grandsires are low accuracy epds .55 tops. as he looks average good to above average in most other aspects. Good looking rascal. His numbers don't mean a thing at that accuracy imho the eye test and actual performance mean much more too me. Geez Nesi...I hope you didn't think I was being excessively critical. Well that's too bad Nesi.